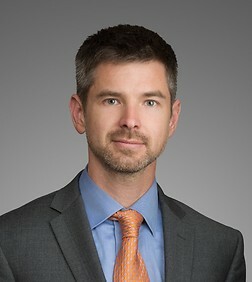 Kyle Mathews is a partner in the Finance and Bankruptcy Practice Group in the firm's Los Angeles office. Represented non-bank asset based lender in documenting 100+ loans (between $2MM and $10MM), engaging in workout/ distress sales with respect to over a dozen of such loans, while incurring de minimis losses. Assisted bank in running a process for the commercially reasonable Article 9 private sale of an operating company, determining highest bid to be from an affiliate of existing equity owner, and engaging in private sale to affiliate with the consent of an assignee for the benefit of creditors. Assisted bank in obtaining the appointment of a federal receiver over an operating company borrower (the receiver then filed a voluntary bankruptcy petition to facilitate a 363 sale) and obtaining a waiver of turnover to permit receiver to remain in place throughout the sale process. Assisted CMBS special servicer in negotiating 9019 settlement agreement that provided for relief from stay and also provided for the appointment of a Chapter 11 Trustee to oversee a consensual plan sale process to preserve certain favorable tax attributes of the borrower. Negotiated favorable debt restructuring and intercreditor agreement on behalf of one of three secured creditors in consolidated bankruptcy cases of multiple related car wash operators and assisted in sale of restructured notes. Assisted bank in connection with: (1) voluntary sale process initiated by borrower following extensive workout negotiations, (2) responding to involuntary bankruptcy proceeding initiated by the holder of second lien debt, including consent to “gap period” cash collateral use and a “gap period” DIP financing facility to support the sale process, and (3) conversion of the case to a voluntary Chapter 11 following selection of a “stalking horse bidder” and (4) a successful 363 sale process. “What to Expect When Your Deal Goes Bad,” Program Chair and Moderator at Spring Meeting of Business Law Section of the American Bar Association, Vancouver, British Columbia, Canada, April 16, 2009. “New Developments in Chapter 11 - Hedge Fund Participation and the Role of Trust Indenture and Indenture Trustees,” Program Chair at Spring Meeting of Business Law Section of the American Bar Association, Dallas, TX, April 10, 2008. “What's Under the Blanket: Perfecting in Collateral Not Covered by a UCC Filing,” Panelist, Committee on Commercial Financial Services, Business Law Section of the American Bar Association, San Diego, California, November 9, 2005.